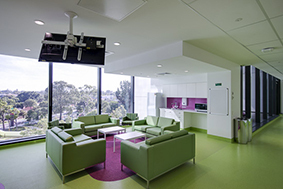 PCH's staged opening took place during May and June 2018, as services transferred from Princess Margaret Hospital (PMH) in Subiaco, which had been Western Australia's main paediatric hospital for more than 108 years. PCH's story began in 2008, when the State Government announced that a new children's hospital would be built to replace PMH and address the future paediatric health needs of the State's growing population. Construction began in 2012 at the QEII Medical Centre site in Nedlands. A year later, the name Perth Children's Hospital was announced, recognising the original name of Western Australia’s first children’s hospital when it opened in Subiaco in 1909 (it was renamed Princess Margaret Hospital in 1949). The PCH Project team consulted widely with national and leading international paediatric hospitals, PMH clinicians, patients and the community during the hospital's design phase. A Youth Advisory Committee was established in 2009 to provide a forum for frequent hospital users to have input into the planning process. The PCH logo is inspired by the growth rings of a tree trunk and features the colours of Kings Park's native flora, fauna, seeds and wildlife. It also reflects the coming together of young people, their families and carers, and our health professionals. The abstract figure of a child at the heart of the design reflects the vision and values of the Child and Adolescent Health Service, of which PCH is a part – placing children at the centre of everything we do.